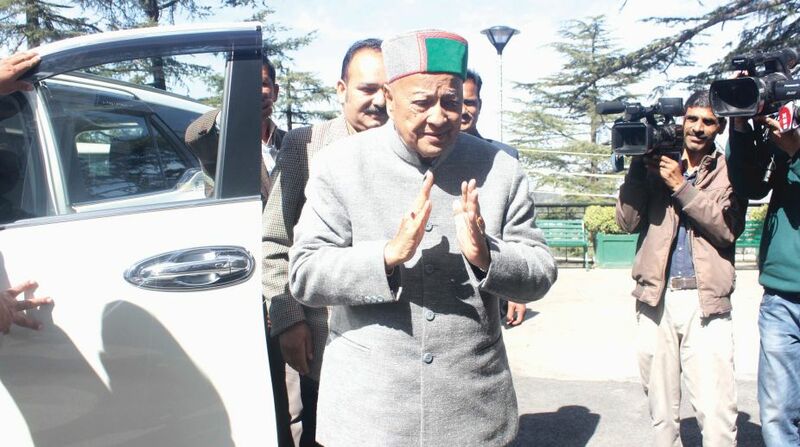 Former Chief Minister Virbhadra Singh during Vidhan Sabha session in Shimla on Tuesday. The state Assembly on Tuesday saw a volley of allegations and counter allegations by the Bharatiya Janata Party (BJP) and Congress members as they participated in the debate on the budget proposals or 2018-19 presented by Chief Minister, Jai Ram Thakur on 9 March in the state Assembly. Opposing the budget, Congress member from Sri Nanina Devi, Ram Lal Thakur said Himachal Pradesh has got its due over the decades due to the Congress leadership in the Centre, which declared it 18th state of the country. He said the state had progressed over the decades and has traversed a tough journey to reach where it is now. “To negate all what happened in the past in Congress rule is wrong and is politically motivated,” he said. Thakur tipped the budget proposals by the CM as ‘old wine in old bottle’ with a slight change in the label. He said the BJP government had been blaming the Congress for pushing the state into debt trap, but will now meet the gap in state expenditure by taking over 26 per cent loans. “The BJP is opposed to loans only when Congress takes it,” he said. He said the deficit budget does not speak about resource mobilisation at all. He urged the government to work out a plan for channelisation of Ali Khad in Bilaspur district, which has receded by 15 feet. BJP member from Paonta Sahib, Sukh Ram Chaudhary alleged blatant irregularities in recruitments in the education department in previous Congress regime. He said the Congress governments in the past have believed in ‘back door entries’ and then making a policy on them, whether it was PTA (Parents Teachers Association) teachers or the recruitments through School Management Committees. He said the Sub-Ordinate Service Selection Board and the Himachal Pradesh Public Service Commission has been by-passed in various recruitments in Congress regime. He attacked the previous Congress government for the role of Police high ups in ‘Gudia case’ who are now in the lock up. Chaudhary blamed Congress for adding up the loan amount on the state by 40.5 per cent in the previous five years. He said the CM had proposed a people friendly and development oriented budget. Participating in the debate, BJP member from Jubbal Kotkhai and former horticulture minister, Narender Bragta said the previous Congress regime did not facilitate the apple growers. He said the Gudia case in his constituency was a blot and reflected the poor state of law and order situation in the previous Congress regime. Bragta said former Congress CM, Virbhadra Singh, the senior most member in the House, has already praised the BJP chief minister, Jai Ram Thakur, holding that he was putting in good effort. “However, the Congress Legislature Party (CLP) Leader, Mukesh Agnihotri is criticising the government on every point,” he said, asking the CLP leader to atleast toe the line of his senior leader.